Solstice Winters has spent most of her life halfway between normal society and the world of her magical parents. However, when getting caught between two worlds becomes more than metaphorical, being able to summon light or open locks might not be enough. Neither her love life nor her professional life are going anywhere in a hurry. Her boyfriend is successful and handsome, but she constantly has to compete with his job for affection. At thirty-two, she works as a photojournalist for The Spirtualist, a small paper dedicated to magic and the supernatural¯that most people regard as a tabloid. Desperate for that ‘one break,’ she’ll do almost anything to get that big story and get into a ‘real’ media outlet. Years of always not quite fitting in begin to make sense after an error at a particle physics laboratory alters the dimensional alignment of the world, strengthening magic and revealing an unexpected truth to Solstice. 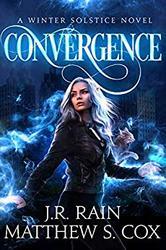 In the wake of an event her boss at the paper is calling The Convergence, magical beings are appearing all over the Earth. Solstice doesn’t hesitate, racing to be the first to capture indisputable evidence of mythical beasts. Alas, being a magical creature herself, she soon winds up in the cross-hairs of not only a three-letter government agency, but an ancient sect of mages with dark intentions.